Sweet, funny, touching, interesting, REAL... Those are just a few qualities that the film 'Chashme Buddoor' possesses and it's one of those films that I can recommend to any film lover without hesitation. The story is deceptively simple and therein lays it's beauty - no overdrawn melodrama, no excessive violence with only the faintest of convoluted plot twists that make you pray the movie comes to a merciful end. Not saying that movies that have all those things aren't fun to watch but sometimes you just want the filmmaker to keep things simple. Sai Paranjpye is one of the few female directors whose work I have seen in Indian cinema and though her body of work is comprised of just a handful of movies they are all worth seeing. Her first one 'Sparsh' was the recipient of both National as well as Filmfare Awards. 'Chashme Buddoor' is her sophomore effort and remains a favorite of Bollywood fans for it's honest portrayal of everyday life in India. Paranjpye was the recipient of the Padma Bhushan by the government of India in 2006 for her contribution to the arts. All Indian movies begin with the above certification from the censor board and are rated either 'U' for unrestricted viewing by all audiences or 'A' for adults only. The certificate also gives other useful information such as when the movie was originally released and how many reels or how long it is - I remember sitting in a theater in India while audience members gasped at anything over 30 reels - that was going to be one long movie! I include this bit of trivia because if you look in the lower right hand corner you will see the signature of none other than the legendary director Hrishikesh Mukherjee of 'Abhimaan', 'Gol Maal', 'Mili' and other classics. His movies were always deceptively simple themselves but had a much deeper meaning that still render them classics to this day. Coincidence that his name was the one approving this film? More like kismat I would say. Before I give a brief synopsis and a few screen shots of the movie I just want to say that if anyone, I mean ANYONE can provide me with that killer poster of Amitabh in the background I would be eternally grateful and would be in your debt for many lifetimes to come. Our film begins with three college students of whom Siddharth (Farooq Shaikh) - our hero - is the quiet studious one and whose best friends Omi and Jai are more interested in the finer things in life. Namely music, movies, cigarettes, general loafing around and of course - girls. Any new girl that moves into their neighborhood is fair game for their ogling and this forms the central plot of the movie when Neha (Deepti Naval) moves in nearby. While the guys all genuinely care for one another Omi and Jai are flummoxed by Siddharth's goody two shoes ways and cannot understand why he just wants to study all the time instead of having fun in life like they do. Their fun of course turns to the pursuit of the fair Neha and while their version of what happened when they went to try and woo her is drastically different than the truth it's part of what makes the movie such a gem. Love the glamour shot picture of our beloved Shabana Azmi in the screen cap above! First Omi tries his luck using his love of shayari (classical Urdu poetry) on the fair maiden. In his recanting of the meeting to his boys (full of lies and exaggerations, i.e. the hallmark of a great story) he tells them that she was actually expecting him. Then he wins her over with his poetry which of course segues into a ghazal with the required costume change. 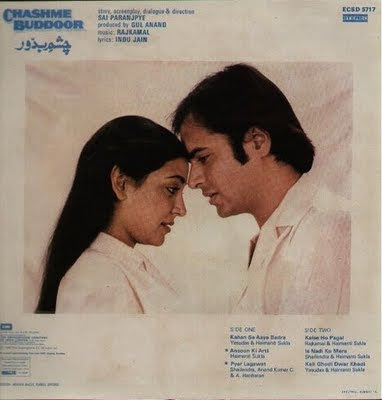 It's worth noting here that Deepti Naval was one of the most respected art house actresses of her day and I would highly recommend just about anything she starred in. After hearing Omi's tall tale Jai decides to try his hand at romancing Neha and does so by pretending to be a big time Bollywood producer. Neha of course is blown away by this revelation (in his version of the story of course) and who wouldn't be? The makers of the film even take a sly swipe at the whole 'long lost brothers reuniting' theme of several masala films of the day, just brilliant. Jai then tells the boys about the 'screen test' he gave to Neha in the above video clip which is one of my favorite scenes in the movie. Lovers of classic Bollywood movies will recognize many of the songs - all acted out by Jai and Neha. Finally we have the scene in which Siddharth and Neha meet (above clip) and it is not only my favorite scene of this movie but of any movie I have seen. It is done with such grace and humility by the two actors and is sweet, funny and incredibly real all at once. If you have ten minutes to spare I ask you to take a break from your day and lose yourself for a few minutes by clicking the play button above. This review would not be complete without mentioning Saeed Jaffrey who plays the mentor/father figure/all around good guy to the boys, Lallan Mia and just never fails to impress in any movie he is in. Add to the mix a couple of guest appearances by two members of Bollywood royalty and you have one special movie. But don't just take my word for it - our friend Beth Loves Bollywood says it's 'endearing, appealing, and engaging. Chashme Buddoor is all those things without being gooey' - and over at Filmigeek it's described as 'perhaps as close to perfect as a film can be'. I think the whole film can be seen on youtube with English subtitles so now you dear reader, have absolutely no excuse not to give it a spin. And if you don't like it, the good Doc promises to buy you a tuti-fruti ice cream next time he sees you. Today's song is Kahaan Se Aaye sung by Yesudas & Haimanti Shukla. You see, Neha is also a lover of the arts and the above video clip is the sad version of this classically rendered tune. Hi! So glad to see another Chashme Buddoor review out here on the BollyBlogosphere :D. I loved this film as well and think Deepti Naval is one of the most underrated actresses. What did you think of the ending though? My memories of it are fading, but I remember it got a little too crazy and out-there and took me out of the sweetness of the movie. Ajnabi - it is isn't it? I usually don't get too swept away with romantic scenes but this one was so honest. And the part where he keeps the door wide open is the cherry on top of that sundae of a scene. MinaiMinai - thanks for stopping by and the kind words. Deepti Naval is an amazing actress and virtually unknown by most newbies to Bollywood. The ending was completely unnecessary as they had such an incredible movie up to that point. It ALMOST took me out as well but luckily the good parts of the movie stuck with me long after the ending faded to black. I've been checking out some Bollywood related blogs here on blogger. I'm liking yours a lot! Nice job! I have started my own Bollywood-related blog...I make little parodies of some popular Bollywood movies. Please check it out! worst film..poor comedy timing..everywhere they tried to make audience laugh which turned out to be flop...silly and senseless comedy,..this can be rated along with himmatwala, houseful, joker and tees maar khan. Lovely Neha - Are you sure you saw the 1981 version? I haven't seen the 2013 remake but several people I know said the remake was pretty awful. Take my advice (and the advice of others) and see the 1981 original, it's an absolutely lovely film. It is so great to see review of this movie here!I am a non-hindi speaker and I am really interested in seeing this film. I got a copy of this movie but it is in hindi only.... I am wondering if anyone here happens to know where I can find the eng subtitle file for this film? Million thanks!